Output from the split core current sensors can be measured using data logging products or energy meters. Compact Smart 3-phase Energy Meter for 1A or 5A Secondary CT's. ModbusRTU protocol. 0.5% Accuracy. Compact Smart 3-phase Energy Meter for 1A or 5A Secondary CT's. Ethernet connection; ModbusTCP protocol. 0.5% Accuracy. Compact Single Phase Smart Power Meter, 2 loops, ModbusRTU, ModbusTCP or CANopen protocol. Click through to select model for required Current/Protocol. Compact Single Phase Smart Power Meter, 4 loops, ModbusRTU, ModbusTCP or CANopen protocol. Click through to select model for required Current/Protocol. Compact Smart 3-phase Energy Meter for AC Current's up to 400A. Output is via ModbusRTU, ModbusTCP or CANopen protocol. Click through to select Current/Protocol Variant. The PM-4324 Multi-Channel Power Meter monitors up to 8 three phase circuits or 24 single phase circuits, or any combination of single or three phase circuits. Click through to select Current/Protocol Variant. Split-core Current Sensor, available in 3 Variants (up to 200A) and with a 0-5Vdc Output. Self Powered. Split-core Current Sensor, available in 3 models (up to 200A) and with a 0-10Vdc Output. Self Powered. Split-core Current Sensor, available in 3 versions (up to 200A) and with a 4-20mA Output. Require power to be supplied. Split-core Current Sensor, available in 7 ranges (up to 200A) and with a 4-20mA Output. Require power to be supplied. Features a wider frequency range for use with VFD controlled loads. Solid-core Current Sensor, available in 3 models (up to 200A) and with a 0-5Vdc Output. Self powered. Solid-core Current Sensor, available in 3 models (up to 200A) and with a 4-20mA Output. Require power to be supplied. Solid-core TrueRMS Current Sensor, available in 7 ranges (up to 200A) and with a 4-20mA Output. Require power to be supplied. Features a wider frequency range for use with VFD controlled loads. DIN-Rail mounting kWh Power meter for both single and three phase monitoring. 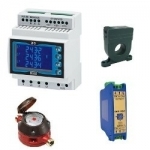 Offers Pulse or Modbus Output. For use with 5A CT's. Split-core DC Current Transducer (up to 200A) with adjustable span and 4-20mA output. Solid Core Current Switch, adjustable setpoint between 1.25A and 200A, for use with resistive or low current inductive loads such as relays or lights. AC Current Switch, 240V/1A output rated contacts. Adjustable trip-point 1-175A in 3 ranges. Mini Current Switch, Solid-Core, 100A rated with 0.5A fixed trip-point. 30Vac/dc @ 500mA switch output. Solid Core Current Switch with Adjustable trip-point between 0.75 & 75A. Line powered with output contacts rated up to 30V ac/dc. Solid Core Current Switch with Adjustable trip-point between 2 & 200A. Line powered with output contacts rated up to 30V ac/dc. Split Core Current Switch with Adjustable trip-point between 2 & 200A. Line powered with output contacts rated up to 30V ac/dc.